If you live in a mobile home, you may have noticed that the walls in your home are different than the walls in other permanent homes. This difference can make painting your walls a little bit more complicated than painting walls in a traditional home. While it is a little more complicated, it isn't impossible by any stretch. You will just need to have the right materials and follow the proper steps. Painting your mobile home walls doesn't have to be hard. Determine what type of walls you will be painting over. 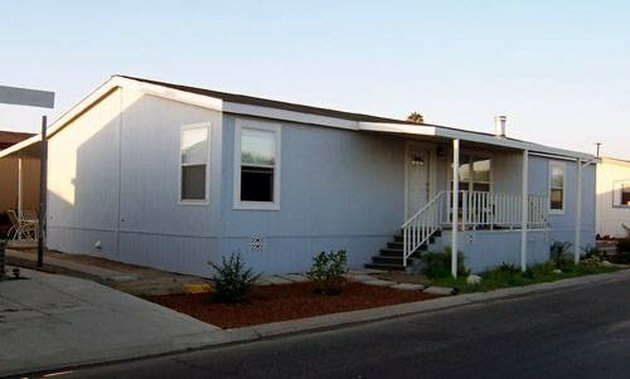 The two common types found in mobile homes are vinyl-coated and paneling. Vinyl-coated walls generally have patterns on them, and paneling normally has grooves in the wall. If you have vinyl-coated walls, skip to Step 3. Apply compound in every one of the grooves in the wall, all the way down to the floor and up to the ceiling. Allow this to dry, then apply another coat. This is needed because the compound will actually contract while it dries. Sand the entire wall with sandpaper. If you had to use joint compound, make sure that the grooves are even with the rest of the wall everywhere. If they are not, fill in the holes with more compound. If you have vinyl-coated walls, make sure you are working to get the wall as smooth as possible, and hopefully as much of the printing off as you can. Wipe the walls down to remove all of the dust and debris from sanding. Begin priming. You may want to select a stain-hiding primer and paint if you have printing on your walls. Otherwise, these may show through the paint in the end. Now let the primer dry. Paint your wall with the color and type that you've selected. You will probably have to apply more than one coat no matter what type of wall that you have to hide any imperfections in the wall. Located in Michigan, Jack Rella has been a freelance writer since 2006. Rella writes mainly health-related and travel articles for Demand Studios. Rella's work has also been published on Associated Content along with other personal sites he has built. Rella is currently attending college to further his career in the medical field. What Is the Difference Between a Knee Wall & a Pony Wall?